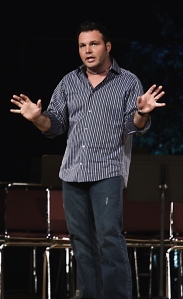 [Did you know] Mark Driscoll is Gay? Mark Driscoll is gay? Don’t kill the messenger…I didn’t come up with this. Another person to recently point out Mark’s hyper (and suspicious) masculinity, is Brett McCracken, within the pages of his new book Hipster Christianity, (pages 103-105.) Get a free copy here. AND-gosh-don’t get me started on John Eldredge! Mark Driscoll's Jesus: Tough and Buff. Mark, if you’re reading this, you can stop over-doing it to throw us off track. Don and I both realize you’ve painted yourself into a corner, Mark. The gig is up, dude. (A bit like gay twins?) 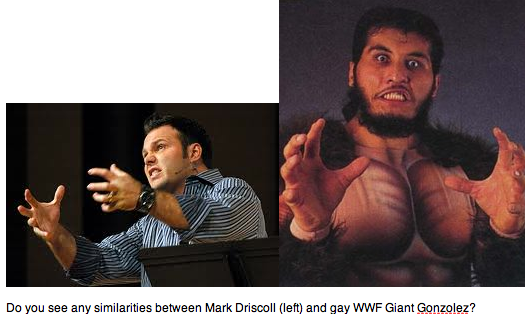 Driscoll and Gay WWF wrestler "Giant Gonzales"
Nevertheless. IF Driscoll was gay, we would love him anyway. Right, everyone? And, Don, thanks for bringing up the issue. Where would we be without you? Just in IgnorantVille, I guess. As a reader, what do you think? There’s a punchline in here somewhere. Can you spot it? Is Mark Driscoll too overtly macho, and (like recent pastors caught in self-created sexual hypocrisy -Eddie Long and Ted Haggard), too anti-gay to be straight? Am I joking about Driscoll? Sure. I’m a humorist. (See subheading of this blog.) Despite loads of circumstantial evidence, and the writing stylings of Don Miller, Mark’s certain proclivity could remain a mystery, much like Theodicy, or atonement theories. This is all probably just a loooong series of coincidences. If Mark is gay, or tempted with homosexual thoughts or feelings, I’m sure we could trust that he’d just open up and tell us–straight out. Um. I mean, well, you know. Right? Right?